Premier Doug Ford along with some cabinet colleagues announced that the Province of Ontario would build a new rapid-transit project through central and east-end Toronto that it’s dubbing “the Ontario Line“. 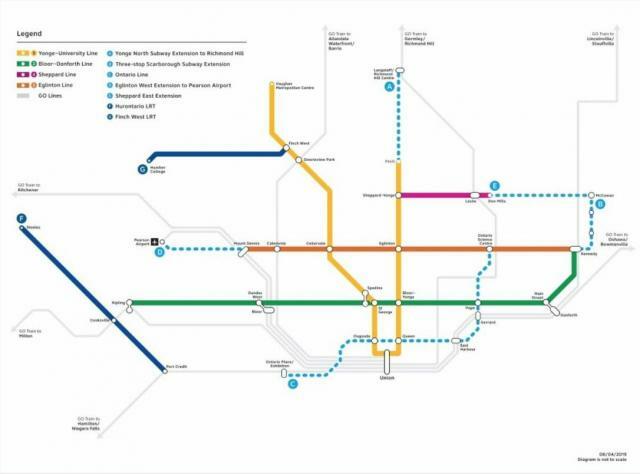 The proposal is the keystone of a $28.5 billion plan to expand “Ontario’s” transit network for which the province is committing $11.2 billion, and is hoping the federal and municipal governments will come on board for the rest. Three suburban York Region mayors were in attendance at the event. Toronto Mayor John Tory was not. The Ontario Line, extending from the Ontario Science Centre to Ontario Place, is the new name for the subway-formerly-known-as-the-Downtown-Relief-Line. It’s a key component of the province’s transformational plan for Toronto transit. 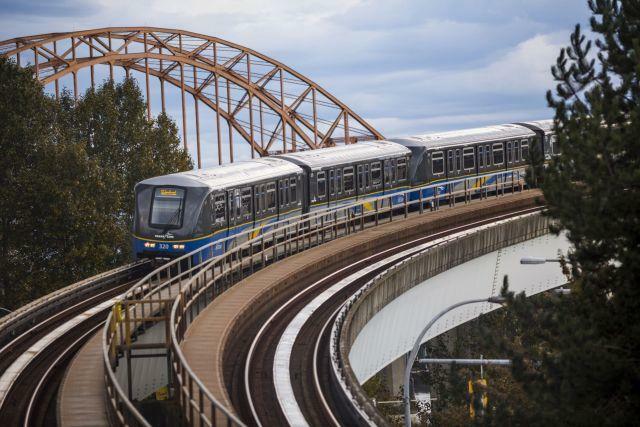 The province expects that this new rapid-transit line will cost $10.9 billion. It will start somewhere on the Exhibition Place/Ontario Place site and wind its way along an unspecified route to Osgoode Station. It will then follow the path that the City of Toronto has already approved for the line to Pape Station and then head northward to end at the Science Centre Station on the under-construction Eglinton Crosstown LRT line. 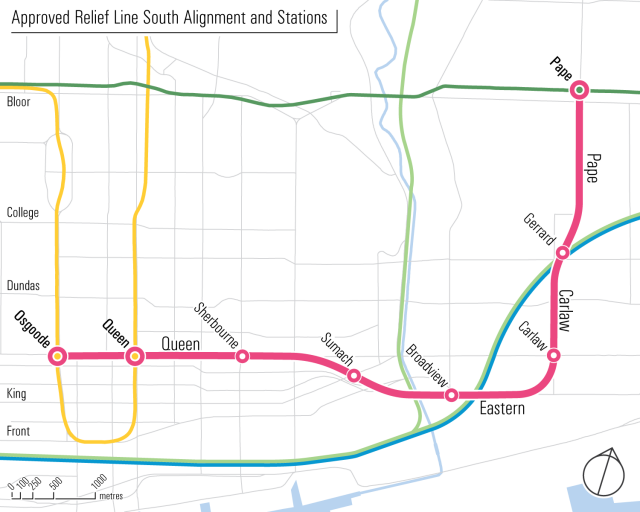 The line would mostly be underground other than for an elevated crossing of the Don River, likely in East York, but details are slim and that isn’t completely clear. The premier has already announced that this line will use alternate technology, instead of the TTC‘s traditional subway cars, but Ontario has not specified what this technology would be. In a news report by Amara McLaughlin, CBC Toronto describes the line as “light rail”. 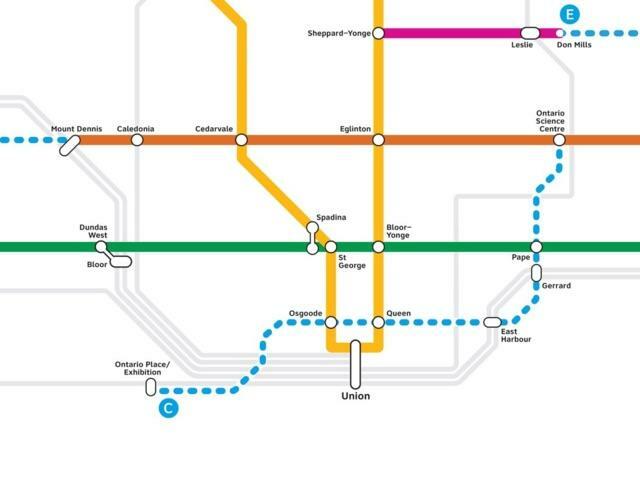 The Toronto Star‘s Rihanna Jackson-Kelso and Emerald Bensadoun explain that the line “will use smaller, automated trains than the existing subway”. In another Star article, transportation reporter Ben Spurr writes, “Examples of similar train technology in operation in other parts of the world include the Docklands Light Railway in London, U.K., and Vancouver’s SkyTrain.” Since SkyTrain is a direct descendant of a type of rail transport first operated here in Toronto in 1985 that, possibly, means that the new line will use same technology that powers the sturdy, but increasingly failing, Scarborough RT. An issue to using different technology than elsewhere on the TTC’s rapid-transit system is finding a location for a yard to store and maintain the trains. Under the current proposal for the line, the TTC would have kept the trains in the Greenwood Yard, accessed via a new tunnel to connect the yard with the Relief Line south and east of Pape Station. The announcement yesterday made no mention of how the Ontario Line trains would be managed. The City recently completed an environmental assessment for the Osgoode-to-Pape section of the line, generally the last step before a project goes ahead. (Rod Phillips, Ontario’s Minister of the Environment Conservation and Parks, approved the assessment report late last year.) The City tentatively targetted 2029 as the date for completing the project after it recently approved a plan to speed up construction. 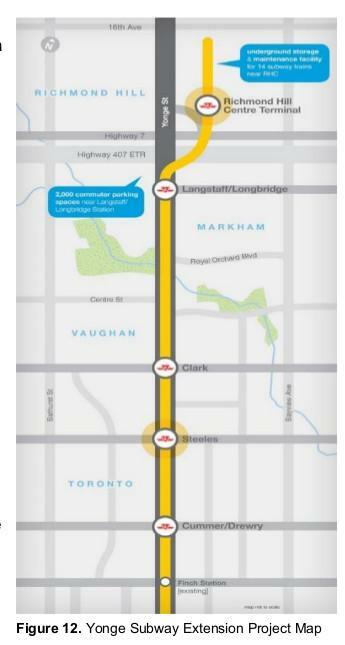 The provincial government will also have to undergo the same process for the new parts of the line before any construction can start, but claims that the line will be open in 2027.
the Eglinton Crosstown west extension, costing $4.7 billion and “delivered before 2031”. Jan De Silva, president and chief executive officer of the Toronto Region Board of Trade, which has long advocated for integrating regional transit said, “[The] transit network plan… includes long-term financial funding for regional transit construction and prioritization of subway transit expansion. Most importantly, it aggressively acts on the City of Toronto’s priority transit projects including the City’s highest transit priority, the Downtown Relief Line, now named the Ontario Line; and, to provide relief to our transit chokepoints at Bloor/Yonge and Union Station. The City and TTC had already committed to extending the Line 2 Bloor–Danforth subway one stop to Scarborough Centre Station at a cost of about $3.9 billion. The city expected to open the extension by 2026, just before the aging Scarborough RT trains reach the end of their operating life. As we learned last week, the partners in this project were ready to start procuring for tunnel-boring contractors, but may have to delay that plan, now that the Premier has added two more stations on McCowan Road—one each at Lawrence and Sheppard avenues. The plan also adds as much as four more years to the timeline and $2 billion to the bill for delivering this project. 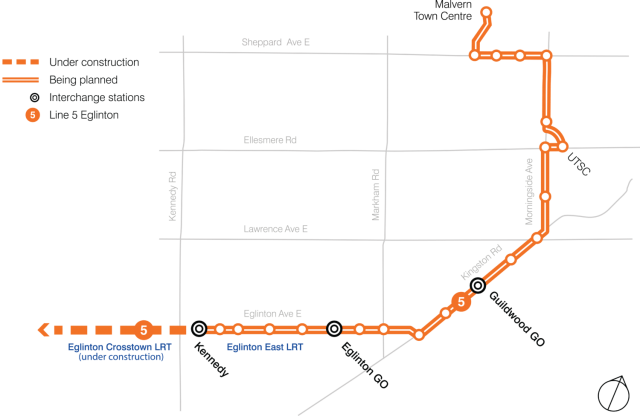 The Province’s version of extending the TTC’s Line 1 Yonge–University subway to Richmond Hill is mostly the same as the TTC, Metrolinx, the City of Toronto and York Region have already planned it. But, the Province is now affirming that the line will not open until the Ontario Line is complete. Ontario now acknowledges that extending the Yonge line northward would result in overcrowding the line unless some sort of, well, relief line is open first. 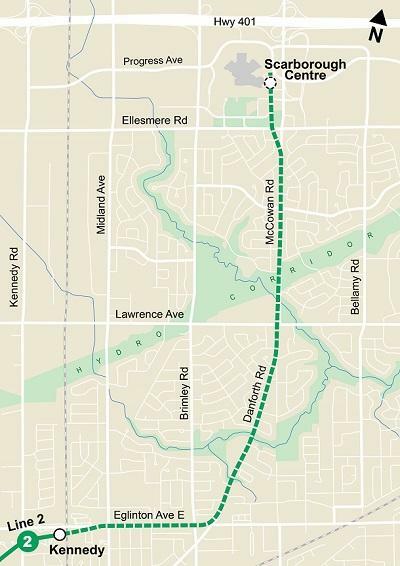 With the fourth project, extending the Crosstown LRT westward, the province has determined that this line would be underground west of Royal York Road, nearly doubling the price tag to $4 billion. The City previously planned to operate this line in the middle of Eglinton Avenue West but was awaiting input from Metrolinx and the Greater Toronto Airports Authority on a further extension to Toronto Pearson International Airport before finalizing its plans. While the Ontario Line station at Ontario Place would definitely improve access to the waterfront, it doesn’t help to increase service where most waterfront development is happening in the East Bayfront/East Harbour/Port Lands area. Meanwhile, Artuso tells readers, “The province intends to build the Ontario Line as a private-public partnership, allowing the private sector to propose some of the design elements, a move provincial officials argue will lower the risk of going over budget. Ontario also expects the Government of Canada and the City to help fund these projects to te tune of $17.3 billion, but, the Premier said yesterday that if other governments don’t step up, that the Province would be prepared to ‘back stop’ the work, especially the extra costs for the Line 2 extension into Scarborough. As part of the announcement, Premier Ford reaffirmed the government’s commitment to working with the City of Toronto to upload the TTC subway infrastructure. According to CBC, Yurek also told reporters at the launch event, “The TTC are great operators. They’re just not experts in building. We can do things the city can’t. We can prioritize, make decisions, and perhaps most importantly, finance these projects.” Despite the comment, the TTC has managed to build all of its infrastructure to date. The Crosstown LRT, however, is being built as a public-private partnership overseen by Metrolinx. Great for jobs and great for people, the announcement may be. 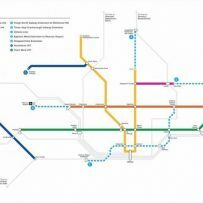 But, while Torontonians understand that the city’s transit network is in dire need of help… the new plans may be frustrating for the many staff who have worked on developing the city’s transit-network plans so far and to the hundreds of people who turned out to public events to comment, ask questions and help shape those plans. Time will tell how much of that work and that input will matter in the new, imposed plan. RHB, Rental Housing Business | Canada’s one stop platform and the #1 National voice to the rental housing industry | © 2019 RHB Inc.